The summer is just around the corner, and those of us eagerly awaiting the sunshine have already started planning our summer getaways. If you’re looking for a bit of inspiration on where to visit in the coming months we’re here to help with our guide to hidden hotspots for those looking to try somewhere new. Last summer, over-tourism was an issue that hit the headlines with major tourist cities including Venice, Dubrovnik and Barcelona openly struggling with the vast number of holidaymakers. That’s why this summer is a better time than ever to get away from the typical tourist trail and explore some alternative destinations. Not only will you get to explore somewhere new and develop your own unique travel experiences, but you will also be helping to support a sustainable tourism industry around the world. In our Hidden Hotspots guide we have had a look at some of the most popular holiday destinations around the world, and offered up an alternative – including some of our own fabulous destinations. One of these is beautiful Cap Ferret, which is sometimes confused with the popular holiday spot Cap Ferrat. Cap Ferrat is a renowned luxury holiday resort in South Eastern France. While the area is undeniably beautiful, the popular resort is somewhat overdone. The chic seaside retreat of Cap Ferret however is a much lesser-known spot, which makes soaking in the Cap's ambience and under-stated charm even more blissful. The picturesque peninsula boasts large sand dunes and sparkling blue waters which offer a stunning setting for relaxing and enjoying the serenity and natural beauty of the Bay of Arcachon. Another of our hidden hotspots is Biarritz, which we suggest as an alternative to St.Tropez. 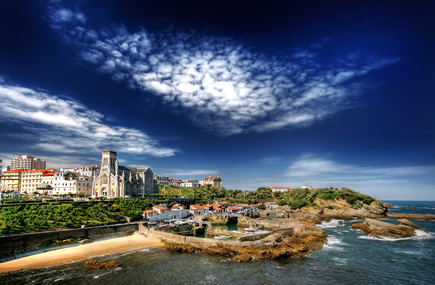 While St Tropez is located in the French Riviera, the stunning resort of Biarritz can be found on the Atlantic Riviera. Biarritz offers up the same glitz and glamour as St Tropez, filled with grand villas and noble history, but this is also balanced with a laidback surf vibe. Other hidden hotspots on our list include Dordrecht in Holland, Treviso in Italy, and Rovinj in Croatia. Have a look at our full guide below and be inspired to start exploring.